“There’s never a Witcher around when you need one,” I said as I watched my friend – and occasional podcast co-host – Matt easily deal with a Drowner in Cintra. I didn’t care that his quest required him to take Geralt to the border of the Nilfgaardian Empire. I had Dandelion stuck in Vengerberg as a Striga prowled the lands. Alas, that’s life in the Northern Kingdoms. Nobles and monarchs plot and scheme, even as their cities are besieged by monsters, plagues, and foreign armies. Witchers, mutated humans who act as professional monster slayers, are as scorned as they are needed. It’s a grim and harsh world, and The Witcher Adventure Game perfectly captures its dangers and wonders. Developed by CD Projekt Red and Can Explode, The Witcher Adventure Game is one half of a two-pronged effort to bring Geralt of Rivia into the realm of tabletop gaming. The other part is a physical game published by Fantasy Flight Games. While I can’t speak about the latter, the former took all of half an hour to win me over. 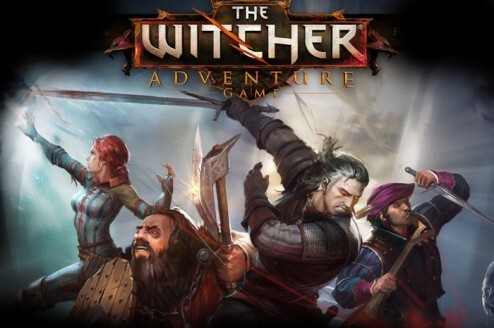 The Witcher Adventure Game, is a semi-cooperative, quest-based, light-RPG along the lines of Arkham Horror. 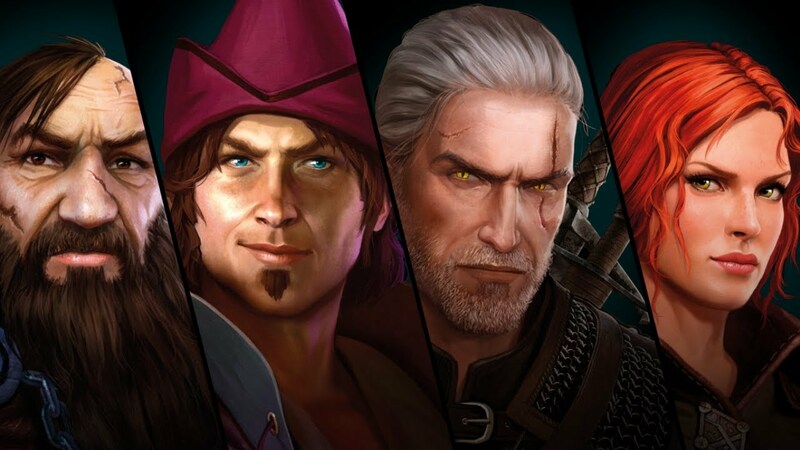 Players assume the role of one of four characters from Andrzej Sapkowski’s Witcher novels: Geralt of Rivia (the eponymous Witcher), Triss Merigold, Dandelion the Bard, or Yarpen Zigrin. Each character draws quests based on their dominant trait – fighting, diplomacy, or magic – and then sets about the Northern Kingdoms to collect clues, fight monsters, and ultimately complete the requirements of their quests. Completed tasks within a quest become victory points, and the player with the most VP wins the game. There’s no direct PvP element to the game, but as my friends and I learned during our play tests, the co-operative mechanics of the game can get very cut throat. The person playing as Geralt might choose to leave powerful monsters in an area to impede the progress of another player. Something as seemingly benign as helping another player with the “support” element of their quest gives the supporter a greater bonus of VP than the supported player. Many a cry of, “get away from me, I don’t want your help,” were uttered over Skype. Much like the books and other video games, The Witcher Adventure Game renders the Northern Kingdoms as a brutal place where telling men from monsters is not always an easy thing. If a player isn’t fighting a monster, then they are dealing with “foul fate” cards, which are replete with all manner of pestilence, cruelty, and suffering. Drawing from the investigation deck offers at least a chance of a positive outcome, but it too is filled with enough misfortunes to make a player feel like the world is out to get them. Make no mistake, this is not a design flaw. It is a conscious attempt to convey the fact that the world of The Witcher is not a kind place. For all the grim tones to the game’s design, its visual aesthetic belies the harsh nature of its setting. The game board, which appears to be set on a table from one of The Witcher’s many taverns, is beautifully drawn. Zooming in reveals subtle animations unique to each of the game’s regions. Brokilon is green and verdant. Kaer Morhen is wrapped in a blanket of snow with a Frightener lurking at its gate. Smoke rises over Vizima (uniquely spelled by its Polish name, Wyzima, even though Dandelion isn’t called Jaskier). Each character has their own uniquely coloured and styled set of dice for combat. Even the music decidedly up-tempo, dare I say cheerful, despite the monsters waiting to savage an unwitting adventurer. I’ll also take a moment to praise the game’s combat and “experience” system. Though Geralt is the game’s monster killing expert, all of the characters will eventually have to square off against a monster. The inherent power imbalance between characters like Geralt and Dandelion required a leveling system that didn’t hinge upon killing things to get experience and level up, lest Geralt always have a clear advantage. As a result, each of the characters has an option to “develop” during their turn. Developing gives each character access a bank of unique skills e.g. signs and potions for Geralt, spells for Triss, weapons for Yarpen, and hired goons for Dandelion. Though dice gods can still be cruel, the development system ensures that even a bard like Dandelion will be able to engage in some meaningful combat. The only downside to this game is it vastly underestimates the time it takes to play. Like many other Fantasy Flight games The Witcher Adventure Game is a long game. A first-to-complete-three-quests game took me about two hours to play with Matt. While I have nothing against long games, they do necessitate an in-game save option, if only to protect against disconnects during a multi-player session. My only other semi-grouse is that Yennefer of Vengerberg isn’t available as a playable character. However, I suspect either Yennefer or Ciri of Cintra (or both) will show up in an expansion for the game – an expansion which will likely be timed with the release of The Wild Hunt. I’m on to you, CPR. Overall, The Witcher Adventure Game is everything that I would expect from a digital version of a tabletop game. The game mechanics are easy to learn. Quest decks are deep enough to ensure a good level of variety from one game to the next. In-game events and encounters shine as a monument to the mythos of The Witcher. In fact, the entire experience feels like a love letter to fans of both the novels and the games. I can easily recommend The Witcher Adventure Game for tabletop aficionados and Witcher fans, alike.